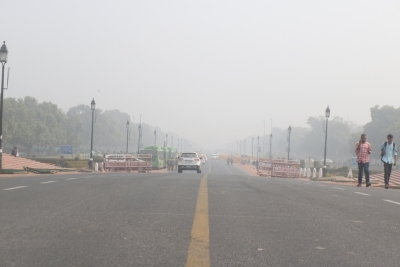 New Delhi, Feb 10 (IANS) It was a cold Sunday morning in Delhi as the minimum temperature was recorded at 8.4 degrees Celsius, a notch below the season's average, while the overall levels of air pollutants was in the 'moderate' zone, the weather office said. "There was shallow to moderate fog in the morning with the visibility dropping to 400 metres in Palam and 700 metres in Safdarjung. It will be a generally cloudy day; however, haze or smoke will cover the sky later," an India Meteorological Department (IMD) official said. Due to low visibility, at least 13 Delhi-bound trains were delayed by at least four hours with one - Sadhbhawana Express - running late by seven hours. The maximum on Sunday is expected to reach 21 degrees Celsius which is two notches below the normal and the minimum will drop to to 6 degrees Celsius, three notches below the season's average. The overall air quality levels in the city at 9 a.m was recorded at 121 (moderate) due to strong surface winds and the recent rain and hailstorm which washed away significant amount of pollutants from the city's air. Owing to good wind speed, high humidity at 82 per cent at 8.30 a.m. did not have much effect on the air quality. "However, it is expected to deteriorate to the 'poor' zone for the next two days," the System of Air Quality and Weather Forecasting And Research (SAFAR) said. Saturday's maximum temperature was recorded at 20.5 degrees Celsius, three notches below the season's average and the minimum temperature was recorded at 7 degrees Celsius, two notches below the normal.